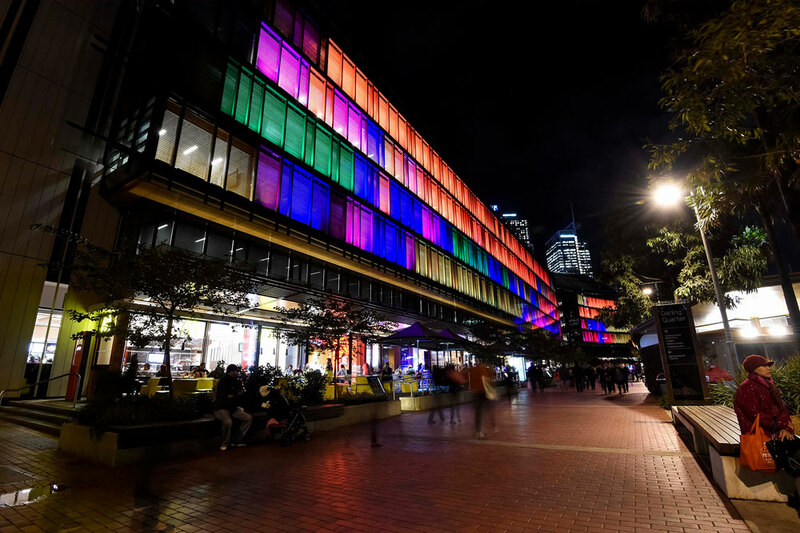 Luminous at Darling Quarter – the world’s largest interactive light installation – brings light and playfulness to the community. Constructed from 557 solar-powered LED lights, it’s set across the enormous 150-metre façade of the building overlooking Darling Quarter. Luminous can be enjoyed live from 6pm each night. On Monday to Thursday and Sundays, the content is pre-programmed by its creator, Bruce Ramus, with a light show that inspires imagination and instils awe. On Friday and Saturday nights, the power of Luminous is handed to the people, with the general public able to take control of the interactive consoles on the two Village Greens. Here, visitors can ‘finger-paint’, play games, and take full command over this vast interactive digital light display, to create their own unique light shows. Luminous is a permanent public art installation that offers a breathtaking backdrop to Sydney’s CBD and invites people to come and play. The digital facade represents the latest in urban innovation, and redefines the way we think of public art, play and communication. Powered by 100 per cent renewable energy, generated by solar panels affixed to the roof, Luminous represents unprecedented advancements in green energy technology. Luminous enlivens the experience of visitors to Darling Quarter, providing opportunity for exploration and the creation of unique – if fleeting – works of art.